Perhaps to compensate for the damp Pacific Northwest winters, Portland is alive with cultural happenings, musical entertainment, theater, and a selection of other fun things to do. But those same rains also nourish the city's impressive gardens, one of the city's attractions. Green spaces range from colorful plantings of roses and rhododendrons to a classical Chinese garden. Portland, the largest city in Oregon, straddles the Willamette River and is considered by many to be one of the most desirable places to live in the United States. The well-known International Rose Test Garden is where new varieties of roses are grown. In the city's mild climate, roses continue to flower into autumn, though visitors can catch an annual Rose Festival in May and June. Another escape, the Portland Japanese Garden, is one of the largest outside Japan and is landscaped on the grounds of an old zoo. Other popular things to do in the park include visiting the present-day zoo, the Portland Children's Museum, and Hoyt Arboretum. The Columbia River marks the Oregon-Washington state border, and its entire length is a remarkable sightseeing region ideal for leisurely drives and enjoying the outdoors. A day trip destination from Portland, the Columbia River Gorge National Scenic Area covers an immense 292,500 acres along the Pacific Northwest's largest river. The trip takes in locks, viewpoints, and hiking trails. Many visitors like to stop and photograph the waterfalls that edge the route, including the towering Multnomah Falls (which flows year-round), lovely Oneonta Gorge, and Latourell Falls in Guy W. Talbot State Park. Especially for its day, the Pittock Mansion had many impressive features including a central vacuum system, intercoms, and indirect lighting. The home is set on 46 acres and at an elevation 1,000 feet above Portland. This allows for exceptional views of the city on clear days. During its heyday, the home was also known for the impressive gardens. That trend continues today, plus the house is mid-way between Washington Park, Hoyt Arboretum, and the many trails of expansive Forest Park. The Rose Test Garden in Portland's Washington Park was founded in 1917 and is the oldest continuously operated public rose test garden in the United States. Developing new rose varieties and even miniatures, the grounds are divided up into several sections with many interesting plants and spaces to explore. Award winners are planted in what is known as the Gold Award Garden, which also features a lovely gazebo. It's best to visit during the late spring bloom. Another lovely Portland rose garden - Peninsula Park Rose Garden - is set in a sunken landscape on the other side of the river. For an easy escape from the urban environment, Forest Park flanks the west side of the city and provides more than 5,000 acres of Northwest forest to explore. Covering the eastern slope of the Tualatin Mountains, Forest Park is one of the largest urban parks in the country and contains more than 80 miles of hiking and walking trails. It's easily accessible by car, bike, or public transportation. The 30-mile Wildwood Trail is popular, as it connects with other pedestrian paths that circumnavigate the city. Bibliophiles will love exploring more than a million books at this legendary used bookstore. Shelves mix new titles with used copies for a slightly haphazard but welcoming feel. Staff picks, clever displays, and plenty of space to lean against a corner and read make choosing a book easier to do. The events calendar at Powell's Books has something nearly every day, including author readings, panel discussions, writing workshops, and many different types of book clubs. This shop on Burnside Street is one of five of the independent chain's locations in the Portland area, and easily the largest. Encompassing 12 acres within Washington Park, Portland's Japanese Garden is located on the grounds of an old zoo. First opened to the public in 1961, the Japanese Garden was built to give the citizens of Portland a place to find serenity in their day and to recognize the growing cultural ties between Oregon and Japan. Both of these impressions remain today at the Japanese Garden, and the area is beautifully laid out in a variety of styles that offer a uniquely peaceful experience for visitors. Garden spaces include the picture-like Flat Garden, the Strolling Pond Garden, and a Tea Garden complete with a lovely ceremonial teahouse. The oldest museum in the Pacific Northwest, the Portland Art Museum was founded in 1892 and has since amassed a substantial and varied collection. The number of items exceeds 42,000, and only a small portion is displayed in more than 112,000 square feet of gallery space. Highlights include Native American artifacts, graphic arts, English silver, Asian art, photography, and Northwest art. One of the Portland Art Museum's most notable pieces is Vincent Van Gogh's Cart with Black Ox. Also part of the museum is the Northwest Film Center and the visual-arts focused Crumpacker Family Library. The Lan Su Chinese Garden opened in the year 2000 to shed light on Chinese culture and history after the city developed a relationship with its sister city of Suzhou, China. This tranquil environment blends rocks, plants, trees, gardens, and a lake on about 40,000 square feet, roughly a city block, of land in central Portland. Artisans came from Suzhou to construct traditional buildings and walkways, and native Chinese plants were imported. Completing the garden is a lovely tea house. Guided and self-guided tours are available, and special events like mahjong, tai chi, and tea tastings also occur at the Japanese Garden on a regular basis. The OMSI complex in Portland includes a theater with a four-story screen, a planetarium, a US Navy submarine, and educational hands-on displays. Among the galleries, visitors will find colorful, entertaining, and educational exhibits for young children, as well as hands-on and interactive displays for all ages. Some of the fields covered may include energy, the environment, health, chemistry, engineering, and technology. Docked just outside the Oregon Museum of Science and Industry is the USS Blueback, a non-nuclear submarine that was in use for more than 30 years. This submarine was featured in the movie Hunt for Red October. Today, visitors can climb aboard for a guided tour. Located in Washington Park, Oregon Zoo features hundreds of species, including many birds and marine animals like Steller sea lions and sea otters. Animals from around the world are represented here, from the African savannah to the Amazon and Arctic. One man, Richard Knight, put together a private collection of animals and began the zoo in the late 1800s. Visitors may also want to take the time to learn about the Oregon Zoo's conservation programs and research as one of the primary focuses is on preserving the species of the Pacific Northwest. Beyond the Pacific Northwest's rhododendrons, this Portland garden also contains azaleas, Japanese maples, dogwood, and magnolias on almost ten acres of land. While the main attraction is, of course, the spring blooms, when the colors are simply incredible, the spectacle continues into early summer. In winter, admission is free, and the garden becomes a more peaceful place to spend some time. The many lovely features include waterfalls and ponds, along with many coniferous trees. For anyone looking for a great place to volunteer their time and meet other community members, regular Wednesday work parties occur at the garden from February through November. Luxury Hotels: One of the most highly rated hotels in the city is the recently renovated RiverPlace, a Kimpton hotel. This boutique hotel lies along the beautiful Willamette River, adjacent to the Waterfront Park, a perfect place for a stroll. Another good option is the Embassy Suites by Hilton in the heart of downtown, near Old Town Chinatown. The Sentinel is also a popular choice, just up the street from Powell's Books, one of Portland's landmarks. Mid-Range Hotels: Just a little outside the main downtown area but close to the chic Pearl District is the Residence Inn. This recently renovated property is an extended stay hotel with large suites. The Courtyard by Marriott downtown has an excellent location and offers good-value accommodation. Fans of unique properties will like the Ace Hotel with its clawfoot bathtubs and funky interior decor. Budget Hotels: The Crystal Hotel is a hip option with unique decor and a salt water pool, in a good location downtown. Another popular hotel is the Econo Lodge, near Portland State University and the Portland Art Museum, known for being good value. The Park Lane Suites and Inn offers both regular rooms and large suites, making it a good option for budget-minded families. 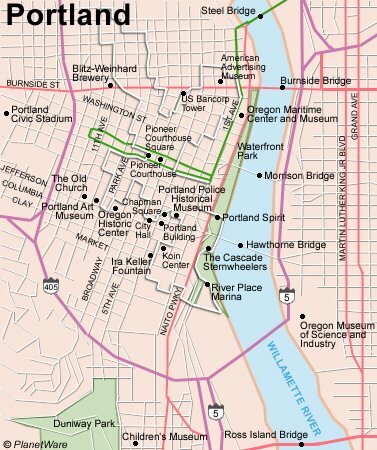 It's also conveniently located near Washington Park, which is home to many of the city's attractions, including the Portland Japanese Garden, the zoo, Portland Children's museum, and the Hoyt Arboretum. Sightseeing Tours: A great way to explore the city without the hassle of parking and finding your way around is the Portland Sightseeing Tour Including Columbia Gorge Waterfalls. Enjoy the convenience of being picked up from your hotel in a bus and seeing all the city highlights, with interesting insider information from an expert guide. On this full-day tour, you'll learn about Portland's food cart culture and visit the city's different neighborhoods and top attractions, including the beautiful Columbia Gorge waterfalls. 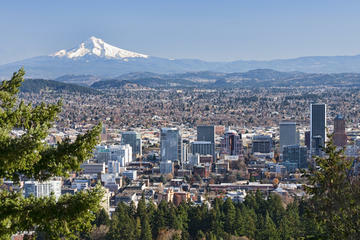 If you're short on time, the Best of Portland Small-Group Sightseeing Tour is a half-day tour in a luxury van or SUV. The tour also includes a convenient pickup from your downtown hotel as well as fresh pastries, seasonal snacks, and a naturalist guide, who shares fascinating information about the parks, gardens, and city landmarks. For a more on-the-ground-style sightseeing adventure, the Portland Segway Tour gives you the flexibility of either a one-hour riverfront tour or a two-hour tour. The longer tour adds even more attractions, such as the Pearl District and Powell's Books, to the same riverside itinerary. 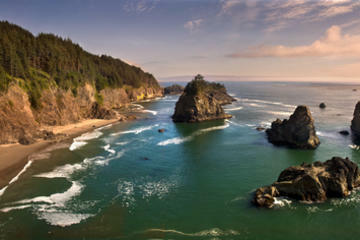 Day Trip: Oregon is famous for its spectacular wilderness areas, and a fun and easy way to see them is on a day trip from Portland. The Mt. Hood Day Trip from Portland to Multnomah Falls and Hood River is a fun way to escape the hustle and bustle of the city without the worry of navigating your way and researching the top destinations. Board the coach from your downtown hotel on this full-day tour, and sit back and relax as your guide leads you through the highlights of the scenic Columbia River Gorge and Mt. Hood area, including waterfalls, the Cascade Mountains, and the pretty town of Hood River.